With this review of InstaNatural Eyelash Enhancing Serum, we have found positive as well as negative aspects about the product. Today we will be discussing a product known as InstaNatural Eyelash Enhancing Serum. 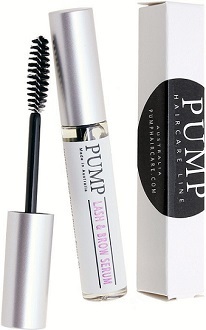 The manufacturer claims that this product will help you get voluminous eyelashes within 30-days. The product is also vegan-friendly, which is an added benefit. To find out more about InstaNatural Eyelash Enhancing Serum ready our full review below. The ingredients found in InstaNatural Eyelash Enhancing Serum claims to be an advanced blend of ingredients that help to strengthen and thicken the lashes. It contains 10% SymPeptide XLash (which is patented), as a peptide that promotes the look of healthier and longer lashes. When looking at other brands, they contain up to a minimum of 5 patented ingredients and also indicate the main active ingredients in the product. In addition to this, the product does not contain clinically proven ingredients such as marsula oil or pea sprouts. It is recommended that user apply the product to the base of clean and dry lashes. You can dab the excess serum if it runs over the face. Before you apply any makeup, first allow the serum to dry completely. Use the product twice a day for best results. The manufacturer adds that the product may also be used on the eyebrows. The product’s original price is $30.00, however, the product is currently on sale for $24.97. Even though this is quite a low price in comparison with other brands, the manufacturer does not offer bundle deals depending on your need. It can be purchased online from the manufacturer’s website, or from a list of online retailers provided on the official website. The manufacturer provides a 100% 120-day satisfaction guarantee. The product may be tried risk-free and if you are not satisfied, you may return it for a full refund. This seems to be a reasonable return policy. With this review of InstaNatural Eyelash Enhancing Serum, we have found positive as well as negative aspects about the product. First of all, we appreciate the fact that the manufacturer indicates exactly when and how the product should be used. Secondly, the manufacturer seems to provide a good guarantee. Unfortunately, we also see many drawbacks to the product, especially when comparing it to other brands. It does not contain a good amount of patented ingredients and the manufacturer has failed to list the main active ingredients. Furthermore, the product does not seem to contain certain key ingredients which could make the product more effective than others. Also, there are no bundle deals for the customer to take advantage of. For these reasons, we do not recommend the use of InstaNatural Eyelash Enhancing Serum. It is best that you search for an alternative product.